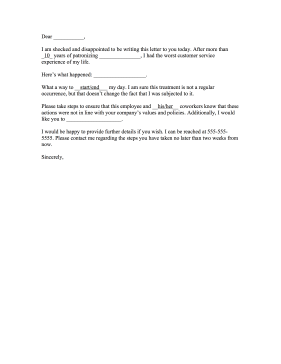 Complain about an employee's poor customer service with this fill-in-the-blank complaint letter. I am shocked and disappointed to be writing this letter to you today. After more than _10_ years of patronizing _______________, I had the worst customer service experience of my life. What a way to __start/end___ my day. I am sure this treatment is not a regular occurrence, but that doesn't change the fact that I was subjected to it. Please take steps to ensure that this employee and __his/her__ coworkers know that these actions were not in line with your company's values and policies. Additionally, I would like you to ____________________. I would be happy to provide further details if you wish. I can be reached at 555-555-5555. Please contact me regarding the steps you have taken no later than two weeks from now.